Romeo Akbar Walter Official Teaser - As we celebrate our nation's 70th Republic Day, let's remember those who have lived and died for our great nation and protected our freedom. Presenting the teaser of 'Romeo Akbar Walter'. 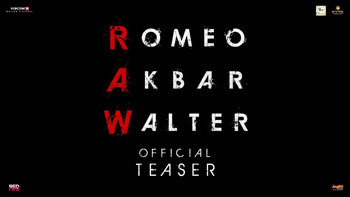 Romeo Akbar Walter (RAW) is produced by Viacom18 Motion Pictures, Dheeraj Wadhwan, Ajay Kapoor, Vanessa Walia, and Gary Grewal. It will release Worldwide on 12th April 2019.